Credit: NASA/CXC/MIT/UMass Amherst/M.D.Stage et al. 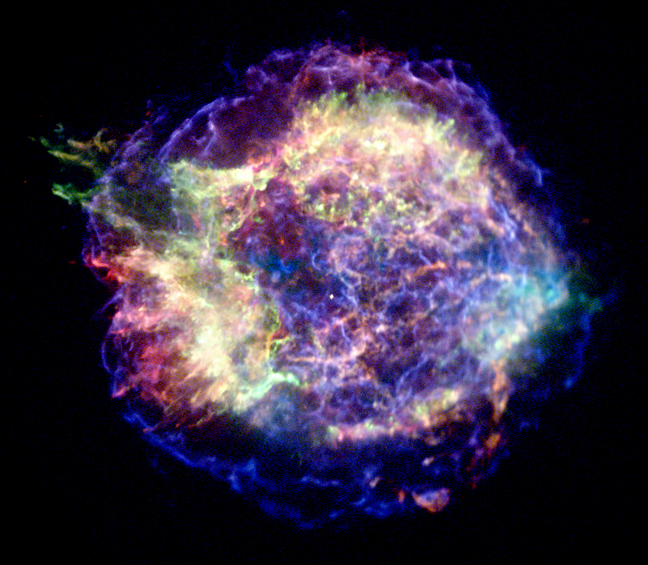 This extraordinarily deep Chandra image shows Cassiopeia A (Cas A, for short), the youngest supernova remnant in the Milky Way. 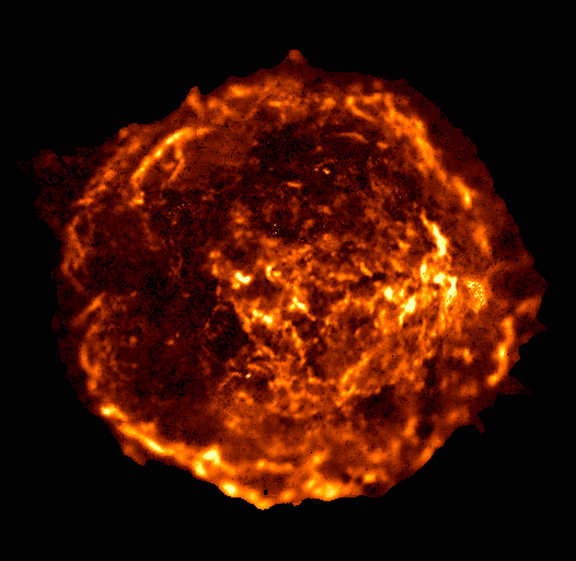 New analysis shows that this supernova remnant acts like a relativistic pinball machine by accelerating electrons to enormous energies. The blue, wispy arcs in the image show where the acceleration is taking place in an expanding shock wave generated by the explosion. The red and green regions show material from the destroyed star that has been heated to millions of degrees by the explosion. Astronomers have used this data to make a map, for the first time, of the acceleration of electrons in a supernova remnant. Their analysis shows that the electrons are being accelerated to almost the maximum theoretical limit in some parts of Cas A. Protons and ions, which make up the bulk of cosmic rays, are expected to be accelerated in a similar way to the electrons. Therefore, this discovery provides strong evidence that supernova remnants are key sites for energizing cosmic rays. Charged particles are believed to scatter or bounce off tangled magnetic fields in the shock wave, which act like bumpers in a pinball machine. When the particles cross the shock front they are accelerated, as if they received a kick from a flipper in a pinball machine. Typically it should take a few hundred scatterings off the shock's magnetic field before the particles cross the shock front. It then takes about 200 crossings of the shock front to accelerate the particles seen in the Chandra data. Scientists estimate it would take about 200 years -- over half the age of the remnant -- to accelerate electrons to cosmic ray energies in the slowest parts of the shocks, but only about 50 years to accelerate the highest energy electrons in the regions of maximum acceleration. Credit NASA/CXC/MIT/UMass Amherst/M.D.Stage et al.